Should Sediba Sashay to the Throne for Oldest Human Evolutionary Ancestor? Should sediba overshadow Lucy, or are both pretenders to the throne in human origins? Since Australopithecus sediba’s “hat” was tossed in the ring as a candidate for the oldest human evolutionary ancestor (so-called) by its discoverer Lee Berger, evolutionary paleontologists have debated several of Berger’s claims. 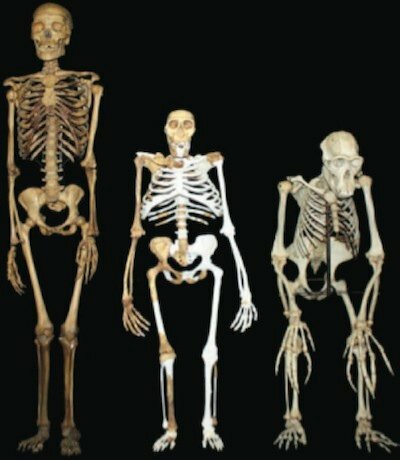 A recent new special issue of Science magazine devoted to the latest research on sediba fossils (reminiscent of a similar one in 2011) hails sediba as an exceptional ape-human (australopithecine-Homo) mosaic. Yet a closer look at the latest analyses reveal that sediba is a fine illustration of ape diversity, but the claims of Homo-mosaicism are clearly in the eye of the beholder. In particular, the latest results reveal numerous problems with the Berger team’s claim of sediba bipedality. Since the discovery of Australopithecus sediba fossils in 2008 at Malapa Cave, some collapsed pits north of Johannesburg, South Africa, anthropologist Lee Berger has been making a valiant effort to place sediba—a name meaning “wellspring”—squarely in the ancestral line of humans. Reports in the 9 April 2010 and 9 September 2011 issues of Science met with mixed reviews from fellow evolutionists. Even the replica of sediba’s skull—now popularly known as “Karabo”—donated to London’s Natural History Museum was, at the time of my visit there in November 2011, relegated to a side hallway far from the human evolution display.1 Will the latest series of analyses just published in the 12 April 2013 issue of Science finally enable sediba to supplant Lucy as the queen mother of human origins? Australopithecus sediba fossils analyzed in the six new articles just published in Science consist of a number of bones from a headless female adult, a juvenile male, and an isolated tibia (shin bone). In addition to an introductory article by Berger (“The Mosaic Nature of Australopithecus sediba”) and an editorial summary by Ann Gibbons (“A Human Smile and Funny Walk for Australopithecus sediba”), there are individual analyses of the mandible, teeth, thorax, vertebrae, and upper and lower limbs. Some critics have suggested that Australopithecus africanus and Australopithecus sediba were the same species. These articles reveal, the researchers conclude, that sediba resembled but was distinct from Australopithecus africanus. Borrowing Berger’s and Gibbons’s descriptives, when sediba “sashayed” with a “swag”3 across the sands of time with a peculiar gait assigned to her by Berger’s team, she apparently shuffled the deck of australopithecine diversity. But did she shuffle along with the seeds of human evolution? The Berger team maintains that sediba possesses a mosaic of traits including many human features. They are sure these features secure sediba’s rightful place as the oldest human ancestor. 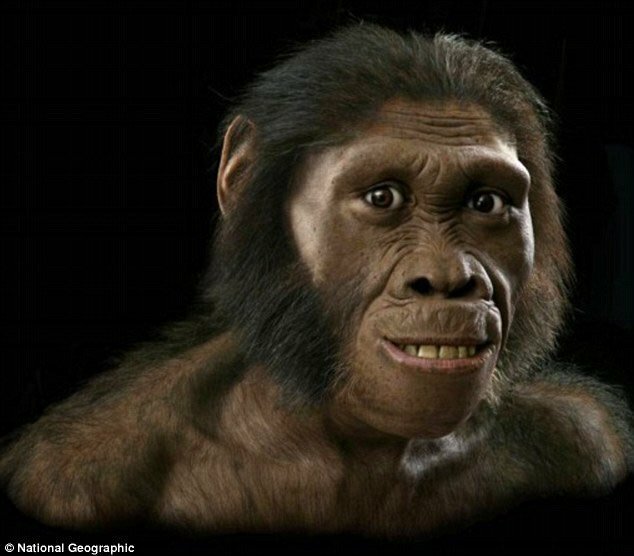 Karabo—“the answer” Lee Berger proposes to the search for humanity’s evolutionary link to an ape-like past—is the name paleontologist Lee Berger has given to the male juvenile Australopithecus sediba, here provided with a number of imaginative features in a “forensic” portrait. Image from National Geographic, via The Daily Mail. The skull of Australopithecus sediba is fairly typical of apes, having brow ridges, a jutting lower face, and no significant prominence to the nasal bones. Image from AFP/Getty Images, via The Daily Mail. The latest batch of anatomical analyses rests heavily on the foundation of conclusions drawn from the 2011 group, which we discussed thoroughly in “Sediba with a Little Sleight of Hand.” Though some of the claims made in 2011 remain controversial among evolutionists, Berger’s team treats those conclusions as axiomatic and takes up the march to the pivotal human ancestral spot from there. Berger writes, “With the exception of the hand skeleton, the upper limbs of the Malapa hominins are largely primitive in their morphology. Au. 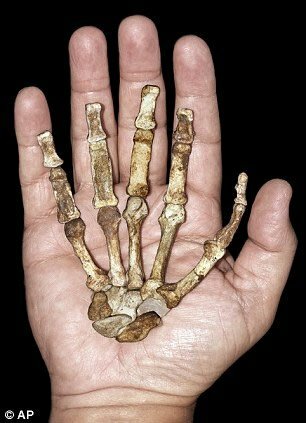 sediba thus shares with other australopiths an upper limb that was well suited for arboreal climbing and possibly suspension, although perhaps more so than has previously been suggested for this genus.”15 In truth, the hand was as well-suited to an arboreal life as the rest of the arm. “Stepping” up to the Plate? Not surprisingly, much of the emphasis in this special sediba issue of Science focuses on showing how Au. sediba walked. As with Lucy (Australopithecus afarensis), the sine qua non for any ape or ape-like animal to claim a place in evolutionary human lineage is a bipedal gait. “Bipedalism has traditionally been regarded as the fundamental adaptation that sets hominids apart from other primates.”16 And not just an inefficient acrobatic maneuver such as any modern primate can achieve will do. 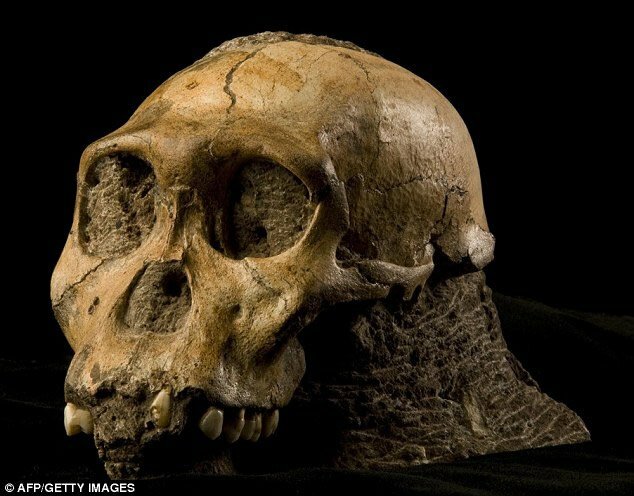 A small brain (like sediba’s) is forgivable in a human ancestor, the current evolutionary presumption being that given enough time and a chance to view the world face on, the brain size and intellect will catch up. A hominin candidate must demonstrate an anatomy suited for sustained habitual bipedal locomotion to enter humanity’s hall of ancestors. Much of the problem in ascribing an upright gait to sediba lies in the inadequate surface area of the heel. The bottom of the heel just isn’t flat enough to provide a stable, stress-dissipating surface at the beginning of a step. Think of trying to walk on ice skates, and imagine the unnatural, unstable, and awkward contortions you would need to make to remain upright walking around on two such feet. In “Body un-designed” we discussed the well-designed human foot anatomy that stabilizes the truly bipedal human gait. Au. sediba’s foot lacks even this most foundational beginning for bipedal walking, a stable start for her step. Ever since Berger’s team revealed the heel was “‘exquisitely small,’ twisted, and pointed as in a chimp,”19 many experts have questioned how such an animal could possibly walk upright. Therefore, in order to keep sediba walking upright, the researchers propose the animal had to strike the ground with the side of its foot and then roll the foot inward (“hyperpronating” it). This proposed hyperpronating gait—described by paleanthropologist Brian Richmond as “provocative”22—would place a great deal of stress on the lower back, the knee, and “any muscle crossing both the knee and the hip joints (e.g., the rectus femoris), particularly those inserting laterally in the leg.”23 Richmond, who was not involved in the study, and others wonder if this particular animal walked in an unusual way due to injury, noting “The key question is whether this was typical for the species.”24 The fossil exhibits evidence of osteophytic change—a bony overgrowth associated with stress—in the region of the knee. The researchers interpret this finding as evidence the “hyperpronating” bipedal gait was normal for sediba as well as evidence for great diversity in the australopithecine proto-human evolution of bipedality. However, such bony changes may have just been a manifestation of chronic stress induced by an unnatural, awkward gait in an individual, possibly injured, animal. And certainly nothing about this anatomy demonstrates evolution toward un-ape-ness. Furthermore, to keep from falling down while hyperpronating, an upright walker would have to shift his center of gravity backward through a “compensatory hyperlordosis”25 of the lower back. Sediba’s lowest lumbar vertebra does exhibit a dorsally wedged shape. Such dorsal wedging is associated with a lumbar curve. Humans have some dorsal wedging, most pronounced on the lowest lumbar vertebral body, and this is associated with the eventual formation of a lumbar curve (aka lumbar lordosis) as we develop an upright posture. Our lumbar lordosis enables us to shift our center of gravity over the hips. The analysis of the upper limb and shoulder confirm sediba was well-designed for an arboreal lifestyle . . . just like other apes. Thus, it seems that sediba’s anatomy was not only totally unsuited for a human sort of stable bipedal locomotion but was instead—unless these bones belonged to a chronically injured animal—uniquely designed for something else entirely. And if the original owner of these bones made a habit of attempting to walk upright when it wasn’t swinging through trees, it placed a great deal of stress on its bones and connective tissues. 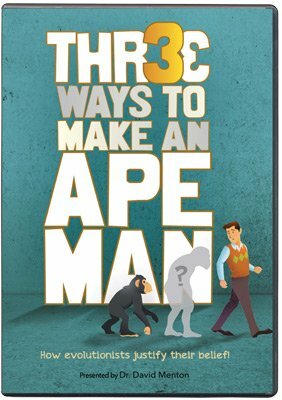 Incidentally, the analysis of the upper limb and shoulder confirm sediba was well-designed for an arboreal lifestyle, “climbing trees or scrambling up rocky cliffsides”33—just like other apes. An additional symptom of Au. sediba’s essential ape-ness is found in its chest. The conical shape of the reconstructed upper thorax is as ape-like as any modern ape’s. Not only is the conical thorax typical of modern apes, it is inconsistent with the anatomy needed for bipedal locomotion.37 The one unusual feature the author’s note is that a fragment thought to probably belong to a lower rib is slenderer than those above it; in living apes the lower ribs are thicker. From this they infer that the lower thorax may have been an evolutionary step toward the slenderer waist seen in humans. Yet they note the rib shows evidence of being tugged on by its attachments to the lower back.38 And as noted above, the lower back of this animal seemed to have a number of unique—not human, just unique—qualities that could have therefore produced this “tug” on the rib. The conical shape of Au. sediba’s upper thorax is not suitable for efficient bipedal locomotion in that it does not allow for the chest rotation that occurs with arm-swinging. The authors write, “The shape of the thorax and the positioning of the scapulae are critical in bipedal gait, as they affect the pendular mechanics of the upper limbs in their role as counterbalances to trunk rotation.”39 Therefore, they conclude from the chest and shoulder anatomy—as with the foot anatomy—that this sediba specimen could not have walked with a standard bipedal gait. Science writer Ann Gibbons, commenting on the new studies, writes, “The South African species may knock the queen of australopithecines, Lucy—a member of Au. afarensis—off her long-held perch as the most likely ancestor of Homo,” but “that’s a radical view.”40 For one thing, many evolutionary paleontologists disagree with Berger’s assertions that his fossils pre-date other presumed ancestors of modern humans. The Homo fossil A.L. 666-1 is dated at 2.33 million years by evolutionary reckoning, making Au. sediba, at just under 2 million years, “too late to the party to be the ancestor of Homo,” as George Washington University paleoanthropologist Brian Richmond explains.41 (We dealt with some controversial gymnastics Berger used to secure a desirable age for sediba in our previous article: Sediba with a Little Sleight of Hand. Furthermore, all of these millions-of-years dates are based on a number of unverifiable assumptions.42) Additionally, other evolutionary paleontologists question the methodology and interpretation of the traits selected to “prove” the human-ward mosaicism of sediba. For instance, the researchers are determined to make sediba walk upright even though they must hypothesize a bizarre, inefficient, and stressful gait for her. This determination persists despite anatomical evidence from the shoulder, chest, and foot that she did not walk upright. Why? Because evolutionists maintain that small-brained ape-like ancestors began to walk upright and then somehow acquired the genetic information to become something far more complex and quite different—humans. Much of evolutionary research is devoted to trying to figure out, not if, but how this could have happened, but no objective evidence that it does (or did) has been found. Studies like these identify various features shared with other vertebrates and then presume to connect the dots of common designs to paint a supposed scenario of human evolution from ape-like ancestors. Yet shared traits—common designs—are precisely what we would expect from a Creator God who is the Common Designer of all living things. And His eyewitness account, recorded in Genesis, indicates He created living things to reproduce after their kinds. In other words, living organisms vary within their created kinds but, as observable biology indicates, do not change into new, complex, different kinds, there being no mechanism by which they can. That Australopithicus sediba’s anatomy differed somewhat from that of modern apes is clear. And these studies all show that it greatly resembled Australopithicus africanus, but also that it had sufficient differences to consider it a different species. Extinct apes, like modern ones, demonstrated diversity. But that is really all this batch of work demonstrates: diversity of apes, not evolution or man’s supposed ancestry. Well, actually, the studies do illustrate one other thing: the obdurate determination, wittingly or not, of evolutionists to make the data say what they want it to say, to align with their predetermined suppositions. Can Karabo Catch Up with Lucy's Legacy? Scars of Evolution or of a Sin-Cursed World? It’s an Ape . . . It’s a Human . . . It’s . . . It’s . . . a Missing Link! For more information, see Elizabeth Mitchell, “News to Note, December 31, 2011: Year in Review,” Answers in Genesis, December 31, 2011, https://answersingenesis.org/answers/news-to-know/news-to-note-december-31-2011-year-in-review/. Lee R. Berger, “The Mosaic Nature of Australopithecus sediba,” Science 340, no. 6129 (April 12, 2013): 163–165, doi:10.1126/science.340.6129.163. Ann Gibbons, “A Human Smile and Funny Walk for Australopithecus sediba,” Science 340, no. 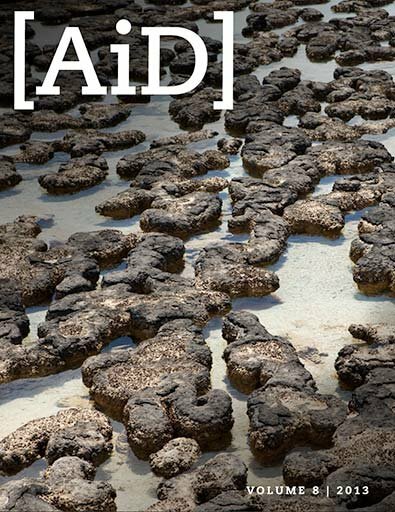 6129 (April 12, 2013): 132–133, doi:10.1126/science.340.6129.132. Science Express on September 8, 2011, Science 333, no. 6048: 1407–1411, http://science.sciencemag.org/content/sci/333/6048/1407/F2.large.jpg. Amar Toor, “Where Did We Come from? Prehistoric Fossils May Rewrite Human Evolution,” The Verge, April 11, 2013, http://www.theverge.com/2013/4/11/4212390/au-sediba-prehuman-fossils-could-rewrite-human-evolution. 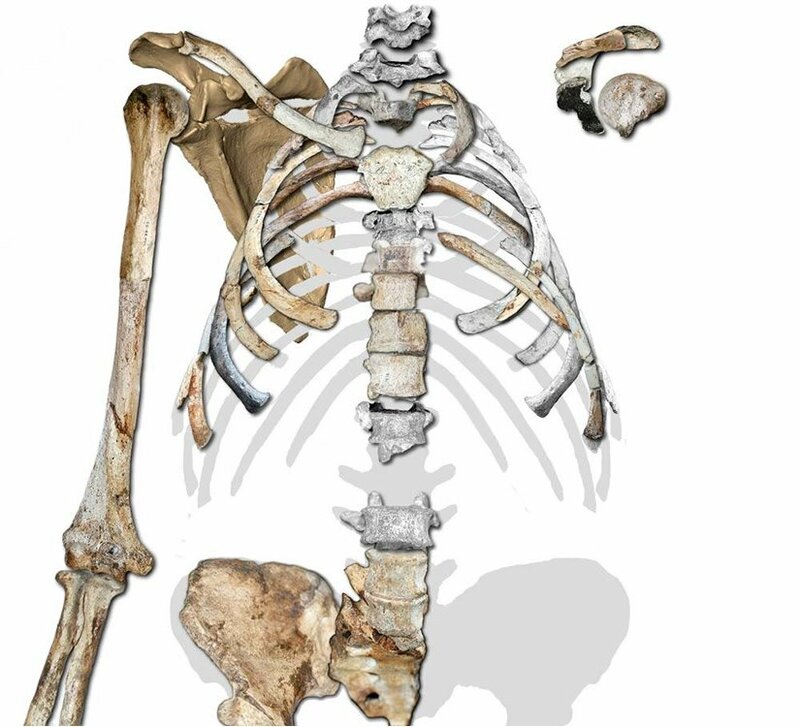 Enrico de Lazaro, “Research Reveals How Australopithecus sediba Walked, Chewed, Moved,” Sci-News, April 15, 2013, http://www.sci-news.com/othersciences/anthropology/article01005.html. Texas A&M University, “Study Confirms Au. Sediba Findings,” Newswise, April 12, 2013, http://www.newswise.com/articles/view/601631. Steven E. Churchill et al., “The Upper Limb of Australopithecus sediba,” Science 340, no. 6129 (April 12, 2013): doi:10.1126/science.1233477. Brian G. Richmond and David S. Strait, “Evidence That Humans Evolved from a Knuckle-Walking Ancestor,” Nature 404 (January 10, 2000): 382–385, doi:10.1038/35006045. Evolutionary anthropologists Brian Richmond and David Scott explained that Lucy could really be a knuckle-walker but still in the human evolutionary line. See recent articles “A Look at Lucy’s Legacy” and Lucy, the Knuckle-Walking ‘Abomination’? about Lucy to learn more about the history and anatomy of bipedal claims. Scott A. Williams et al., “The Vertebral Column of Australopithecus sediba,” Science 340, no. 6129: doi:10.1126/science.1232996. 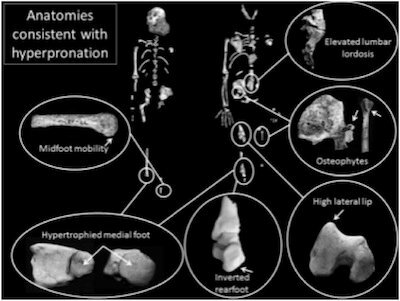 Jeremy M. DeSilva et al., “The Lower Limb and Mechanics of Walking in Australopithecus sediba,” Science 340, no. 6129 (April 12, 2013), doi:10.1126/science.1232999. See “Scars of Evolution or of a Sin-Cursed World?” to learn more. This was reported in Journal of Anatomy and Physiology, a publication of the Anatomical Society of Great Britain and Ireland, 24 (1890):48–50, describing previous work by D. J. Cunningham as well as original work by Dr. Johnson Symington. Martin Haeusler, Sandra A. Martelli, Thomas Boeni, “Vertebrae numbers of the early hominid lumbar spine,” Journal of Human Evolution 43 (2002): 621–643; and David Pilbeam, “The Anthropoid Postcranial Axial Skeleton: Comments on Development, Variation, and Evolution,” Journal of Experimental Zoology (Molecular Developmental Evolution) 302B (2004): 241–267, doi:10.1002/jez.b.22. Peter Schmid et al., “Mosaic Morphology in the Thorax of Australopithecus sediba,” Science 340, no. 6129 doi:10.1126/science.1234598.